ATM manufactures a selection of Waveguide Passive Dehydrators ranging from WR28 to WR650. The passive waveguide dehydrator is a low-maintenance, reliable method to remove moisture from waveguide systems. It uses a canister of desiccant to naturally absorb moisture from the waveguide system and collect it in the dehydrator. Replacing the contents of the canister every 12-18 months keeps moisture levels in the waveguide system low to prevent corrosion from forming. ATM Passive Dehydrators provide cost-effective drying of small volume waveguide systems. It can be used for backup dehydration in larger systems, eliminating the need to run a pressurized system on emergency power. Standard Models: Employs a desiccant drying system which lasts 12 to 18 months or more, before needing service depending on environmental conditions and system volume and tightness. 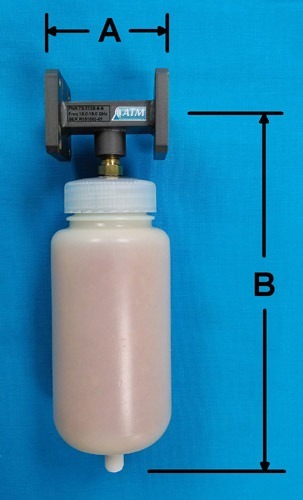 The desiccant material is designed to change color over time, indicating a need for regeneration, which is easily accomplished by heating the material in a convection oven. Typical Applications for Waveguide systems should be limited to 11 feet in length, or a max of 1 cu. foot for best effectiveness. The Canister Assembly is mounted to the Waveguide Broadwall, and is designed to be mounted with canister facing sideways or down as shown. Extra canisters can be ordered using the model number to the right. 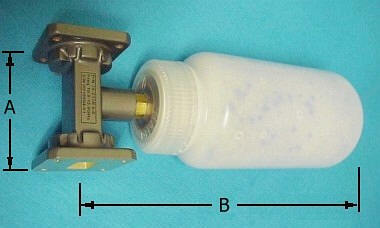 This is the standard spare canister for all waveguide sizes.